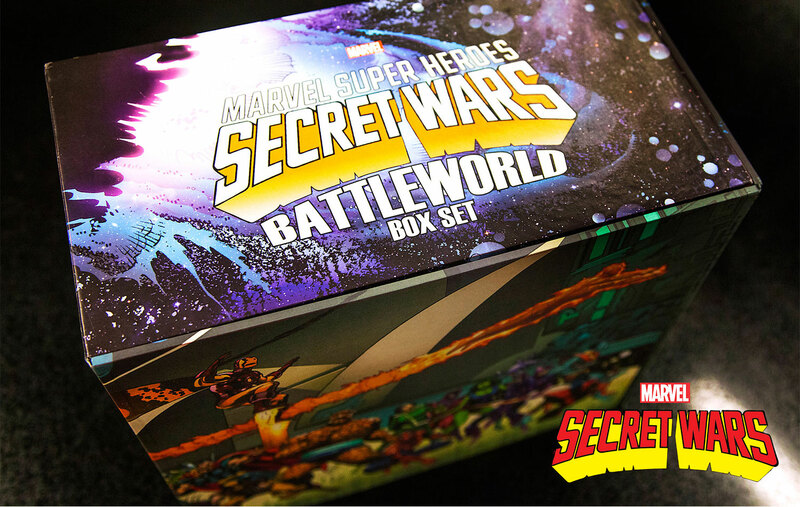 Behold… Marvel Super Heroes Secret Wars: Battleworld Box Set Slipcase! 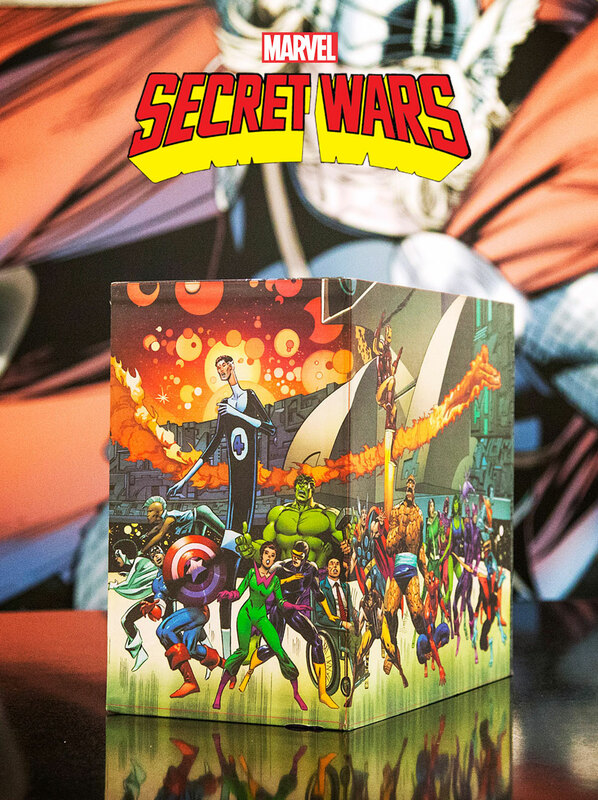 Before the all-new Secret Wars takes the comic world by storm in just over a month, relive the complete Marvel Super Heroes Secret Wars legacy in one complete, stunning package. 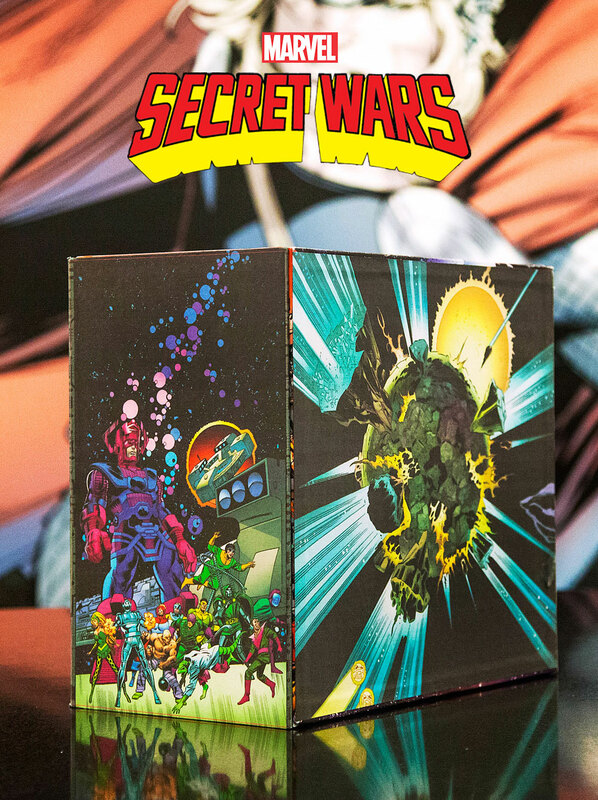 Today, Marvel is proud to present your first look at the MARVEL SUPER HEROES SECRET WARS: BATTLEWORLD BOX SET SLIPCASE, a deluxe collection of 11 hardcovers chronicling the history of one of Marvel’s most storied events! Available in June, readers will be transported to Battleworld and back as they experience over 30 years of Secret Wars stories in one of the most comprehensive collections we’ve ever released! 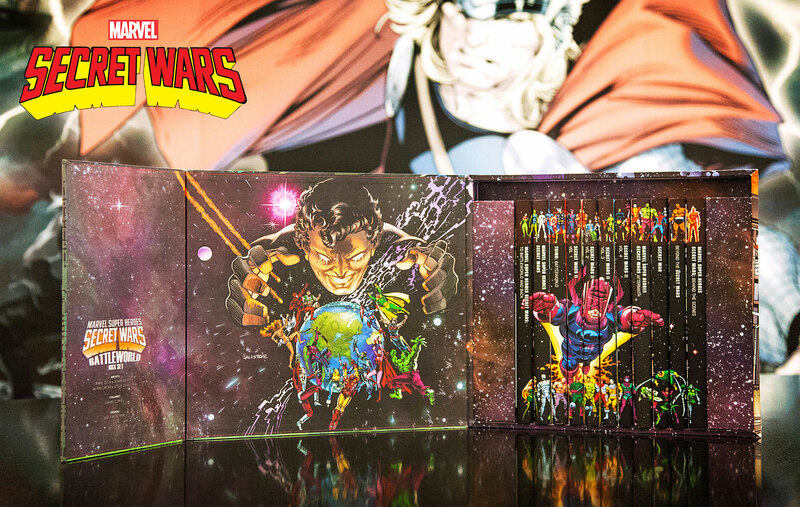 Plus, each of these extremely limited box sets comes complete with a full-size poster: legendary painter Alex Ross’s rendition of the cover to Marvel Super Heroes Secret Wars #1! Collecting THOR (1966) #383, CODE OF HONOR #3, SHE-HULK (2004) #10, DEADPOOL TEAM-UP (1998) #1, MARVELS: EYE OF THE CAMERA #4, QUASAR #8, FANTASTIC FOUR (1961) #351, THANOS #8-10, and material from FANTASTIC FOUR ANNUAL #23-24 and #26-27. 280 pgs. – collecting Secret Wars II #1-3, New Mutants (1983) #30, Captain America (1968) #308, Uncanny X-Men (1981) #196, Iron Man (1968) #197, Web of Spider-Man (1985) #6, Amazing Spider-Man (1963) #268, Fantastic Four (1961) #282 and Avengers (1963) #260. 352 pgs. – collecting Beyond! #1-6, Spider-Man & The Secret Wars #1-4, What IF? (1989) #4 and #114, What If? Secret Wars, and Venom/Deadpool: What If? 360 pgs. 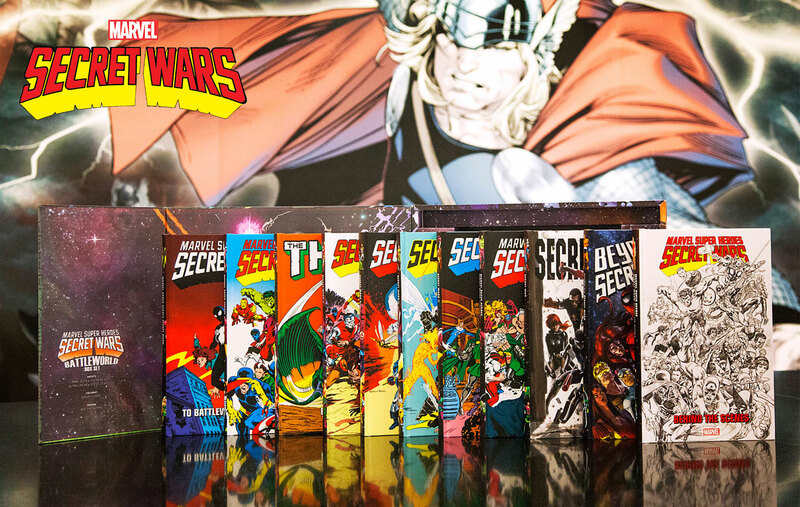 – The secrets behind the Secret Wars! Discover everything you ever wanted to know — and more — about Marvel’s history of covert combats in this compendious collection of bonus content and special features for MARVEL SUPER HEROES SECRET WARS, SECRET WARS II, SECRET WAR, BEYOND! and more! From original art to design sketches to posters to MARVEL AGE articles to OFFICIAL HANDBOOK entries to alternate and reprint covers — if this volume doesn’t have it, you don’t need it! See Mike Zeck’s original pencils for MARVEL SUPER HEROES SECRET WARS #1, and the original version of SECRET WARS II #1 by Sal Buscema! Learn about the shield-slinging, secret-swapping action-figure line that tied in with the comic! Savor a gallery of rarities from Marvel UK! And prepare to get nostalgic as we shine a spotlight on the original epic, thirty years on!